This stretch is a grounded version of the yoga pose Warrior 3. It targets deep into the hip and down the IT band. Standing on one leg, extend the other leg straight back behind you and point the toe down to the floor. Reach through the back heel and squeeze through the quad. Fold the forehead down towards the shin by engaging your abs and walking your fingertips as close to your feet as possible. This is the yoga pose revolved half moon and it will take you a little deeper in the hips and IT bands than grounded warrior 3 while also giving you a gentle spinal twist. Start in grounded warrior 3. Bring the hand on the same side as the extended back leg down to the floor or a block about 6-8 inches in front of the foot. Lift the opposite hand up, working to rotate the shoulders open to stack. If you don't have a block you can use a water bottle or anything else that helps bring the floor closer. This is the yoga pose revolved triangle and it gets straight into the hip and IT band. To get into it take a short step back and square the hips, keeping them hips distance a part. Bring the hand of the same side that the foot stepped back to the inside of the front foot. I like to use a block here to make sure I can keep my hips square and my knees straight. 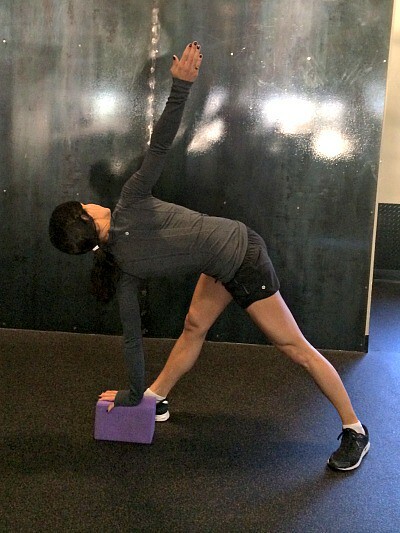 Lift the opposite hand up in the air and work to rotate the shoulders open to stack, twisting out of the upper back. Best effort to keep both legs straight, the ribcage long and both heels on the floor. Seated twists are great for both the spine and the hips! Extend one leg out long and cross the opposite ankle to the outside of the extended leg. Bring the elbow to the outside of the bent knee. Press the arm into the thigh and the grounded hand into the floor as you twist. This last seated stretch is a variation of the yoga pose gomukhasana and you'll feel this intensely in your hip and IT band and also in your hamstring. Extend one leg straight out in front of you and cross the opposite knee over the extended knee. Begin to gently lean forward. This is a deep hip opening and it may be hard for some to get into this stretch if your hips are tight. If that's the case for you try sitting on a block for a modification or skip this one and try one of our three pigeon variations. 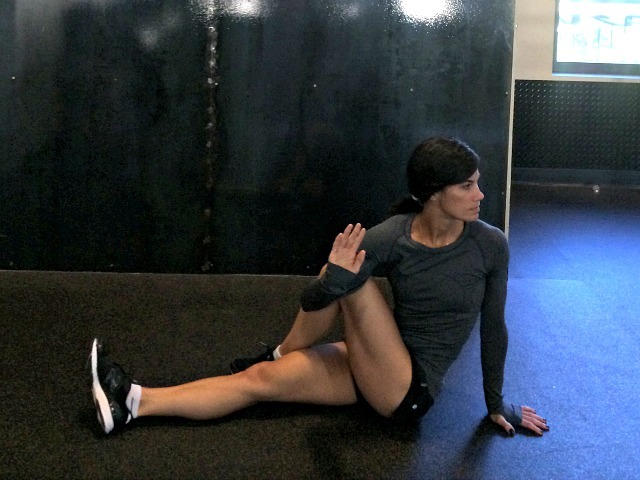 Remember, stretching and mobility work is extremely beneficial when it comes to running healthy and preventing injuries. Be sure to dedicate time to it in your training program! Jen DeCurtins is the content manager for Run Charlotte Run. She is a certified personal trainer, 200-hour registered yoga teacher, CrossFit coach and food and fitness blogger at Peanut Butter Runner.